Krista Tippett understands there’s a crisis in American religious institutions, and she knows it’s a painful and scary time for Christian leaders. But at the same time, this seminary-trained Southern Baptist-turned-Episcopalian sees hope in the ferment. Tippett is a Peabody Award-winning journalist and author who is host and executive producer of “On Being,” a podcast, radio show and website focusing on questions of meaning, values, religion and ethics. Tippett has a diverse background -- she worked as a journalist and diplomat in Cold War-era Berlin before earning an M.Div. from Yale University -- which she draws upon in conversations with a broad array of guests, including the Dalai Lama, Jean Vanier, Seth Godin and Yo-Yo Ma. Tippett was at Duke University as the 2015 Kenan Distinguished Lecturer for the Kenan Institute for Ethics. She also spoke with Faith & Leadership. The following is an edited transcript. 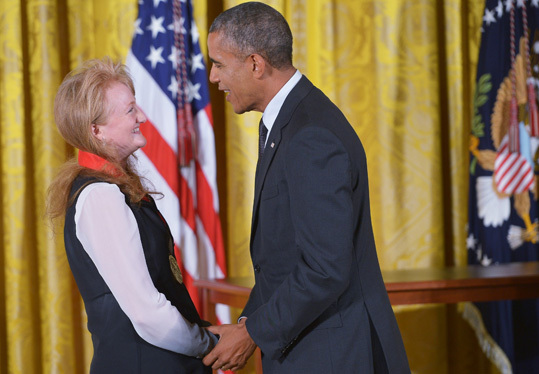 President Obama awards Krista Tippett the 2013 National Humanities Medal. Q: How do the pieces of your professional and personal background fit together to form your current vocation? I do actually feel like everything -- all the pieces of it find some kind of expression and purpose in what I do now. Growing up Southern Baptist in a really immersive, religious, Bible Belt world -- I think it’s so important as a public radio person that I had that background. It was really in Berlin -- where I ended up, in a very quirky way -- that I was fascinated by huge geopolitical questions of communism versus capitalism, and the nuclear arms race, and the division of the world into these different ideologies. But it was also there where I started to see that people could be immensely powerful and have pretty impoverished inner lives, and people could live in East Germany, where they had nothing, and create lives of great beauty and dignity. And so it was there that I started asking spiritual and theological questions, and that led me to get my M.Div. And then when I finished, I still saw the world through the eyes of a journalist. In the mid-’90s, when Jerry Falwell and Pat Robertson had been enshrined by journalists as who religious people are, I was just so aware that it was just such a tiny part of the picture. I had this kind of compulsion to find a way to tell more of the story. So it all somehow does feel like it comes together for me. Q: How do you use your seminary education in your work now? I think it’s completely interwoven. When I first started the show, I remember that when I first had an office at American Public Media and I brought in all my New Testament books from seminary, I was sure that I was the only person working in public radio who had these texts, who would do exegesis if I had to. In the beginning, I was a lot more overtly aware of it. But I started the show right in those immediate post-9/11 years, when suddenly we’d all woken up to Islam by way of this act of terror. But it’s this religion of over a billion people, and I was really aware that having a grounding in [Christian] theology was a foundation for starting to take seriously other forms of theology. Just knowing how to look at sacred texts was really important; it had given me a set of skills that transferred. Q: Do you think that’s an unusual perspective in public radio? I remember feeling again in the early 2000s -- George W. Bush was in the White House, we had this evangelical president in the White House, and all of this religious energy around voting. And there was all this journalism that was really inadequate, really kind of simplistic in a way that they would never be simplistic about political or economic actors. The New York Times, which I love, had just kind of discovered -- just discovered -- that 40 percent of Americans are evangelical Christian. So I felt at that time so grateful for my upbringing in the Southern Baptist church, and my grandfather, who was an evangelist, essentially. My theology is not my grandfather’s theology, but this was someone I loved, and I understood the humanity of that statistic of 40 percent. Forty percent of the American people is a very diverse swath of humanity. And I wasn’t seeing that represented in a lot of the journalism. I didn’t see any place for my grandfather in that picture. And so we did a lot of shows in those years about diversity within Christianity and within evangelical Christianity, just to put that out there. Q: How do you situate yourself as a Christian now? I had not taken religion seriously for about 10 years when I was in Europe. It’s not like I ever stopped being Christian, but when I started taking my Christianity seriously, I was living in England, and so I went to the Church of England and became an Anglican and then Episcopalian. And what I loved so much that the Church of England gave me was the sweep of church history and the communion of saints, and also liturgy, because I hadn’t been in a liturgical tradition. It was all new to me, even though I had gone to church three times a week for 18 years. I kind of hesitate to say I’m Episcopalian. I mean, I’m Christian. I say I’m Christian first. Q: You often include being a mother as part of your vocation. I love the language of “vocation,” and I worry that we identify it too closely with job title. I’m fortunate to have work that is meaningful in and of itself, but everybody doesn’t have that. So I think of vocation as being as much the person I am as the work I do, and being a parent is constantly with me. Why not let it show a little bit more? Q: As you speak to your audience and you hear back from your audience, what’s your sense of what people are yearning for? What questions are they asking? I’m pretty fascinated by their religious energy right now, and I see a few things. I see depth and real theological rigor, even within searching, that I think is new. I think that the New Age of the ’80s -- a lot of what came out of that movement -- has really grown up. I see young people who grew up in the years of this strident religiosity who are just allergic to stridency. They are questioning what churches are for and what religion is for, but they’re often doing it in a way that I feel is so faithful to the heart of the tradition. They want church to mean something. They want their spiritual lives to be reflected in their lives in the world. There’s a lot happening among younger generations, and what looks like a fluidity of religious identity in fact has the capacity to be real spiritual renewal for our institutions. I actually have a lot of trust and faith in the kind of robust way people are struggling. And then I think the question is, will the institutions rise to the occasion? Because I think there’s a lot of possibility here. Of course, it’s just such a complicated and really traumatizing time, because all of our institutions -- not just churches, but our political institutions, our economic institutions, our educational institutions, the way we’ve done medicine -- none of this makes sense anymore, right? And so religious institutions -- churches, in any case -- are faced with having to reinvent the basic structures. Not theology, really, but how do we function. Fifty years from now, the forms may be very different. And then there’s this world out here, which is disconnected from it, or kind of weaving in and out of it, that is trying to grapple with what should a church be, and what should it mean to be a person of faith in the modern world. There’s real integrity and substance to that struggle. And what’s going to be interesting to me is to see how these things can overlap, how they run into each other. Q: Where do you see institutions and people connecting? I did some writing about that and heard back from people who said, “I have a church full of ‘nones’” or, “I have a synagogue full of ‘nones.’” I am aware that there are religious leaders out there who are creating hospitable spaces for people to feel at home even if they don’t feel comfortable with the labels, so that’s happening. I interviewed this young man named Nathan Schneider, who I think of as kind of a millennial public theologian. He’s somebody who was raised by his nonreligious parents to try it all out and choose your own, and then was baptized in the Catholic Church at 18. He walked toward it, and he chose it. Then a lot of them got caught up in Occupy Sandy, which was this work of practical care, and a lot of that stuff got centered in churches. Another interesting thing I see is how the church in the downtown that was once the center of a vibrant city is now a place nobody goes on the weekends. That’s a different role for the church than it used to play when it had these rolls of hundreds, but it’s new life. And it might be new life that is close to the heart of what Christians and the church are called to be in the world. I see that everywhere. I hesitate to be somebody offering advice to religious leaders. I do, and I also know very well what a complicated situation people are in, and a painful situation, and a scary situation. But I guess what comes to mind, and I offer this with humility, is I think it might be more fruitful and more faithful to be asking, not just questions about the survival of the institution, but what are the faithful questions to be asking of our place in the world? What are the needs and hungers and crises of the people walking past our doors every day? What is our calling now in this place? And I feel like living into that question might be a great way to start appealing to the nones and the unchurched. Q: Which of your recent interviews would you recommend that Christian leaders listen to? One thing that pleases me is when I hear from preachers who say that listening to the show becomes a way of self-care for them. And I think some of that is just about people who are constantly being asked to preach and to impart wisdom being able to take in some wisdom that feeds their souls. I had an interview with John A. Powell earlier this year. He’s not a religious figure, but he says that the limits of our collective encounter with race have, in part, to do with the fact that we have to venture into spiritual territory. For him, it’s a question of belonging. How do we realize our belonging to each other? And to me, that’s as theological as any language could be. Sister Simone Campbell, of Nuns on the Bus -- we did a live event with her in our studio, and I was so impressed with how relevant her way of talking about joining contemplation and action was for these ordinary people leading ordinary lives. She’s a nun, but she’s also a lobbyist and a lawyer, and she talked wonderfully about being grounded in contemplation and being committed to making a difference in the world, and the interplay between those two things. I don’t think there’s so much guidance for people on that. Q: Have you done any interviews about leadership? I shy away from people in authority, whether political or religious, because they are bound to represent an institution or a group. And so it’s hard, and sometimes just not possible, for them to really engage in a free, probing, first-person conversation. But I interviewed Nadia Bolz-Weber, who’s a Lutheran pastor. And Jean Vanier, who started the L’Arche communities. Leadership is one of these fluid terms, right? Leadership is not anymore just narrowly associated with the person who has the president or chief or priest title. I think that’s a good thing.